We all chat on Facebook with our friends. But don’t you find that chat some what boring with the same default color all the time. 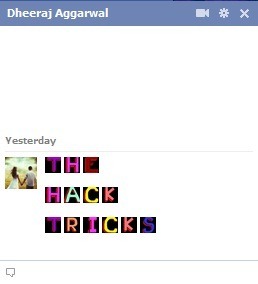 So to generate some fun we are giving you some codes, with which you can write with colors in Facebook chat . The codes are not at all difficult to implement, you just need to copy a particular code for every alphabet to your chat window and it’s done. The above photo is made using the same color codes. Just copy the alphabets one by one, inserting a space between every code of the next alphabet. For all Facebook tricks see our always up to date Facebook Guide.